The artist/title/album labels in the sound menu are often hard to read because they get ellipsized fairly quickly (i.e., for relatively short labels). Also, the menu is visually unbalanced in languages with longer strings (making the menu wider), because the playback controls are hardcoded with a ~100px left margin. 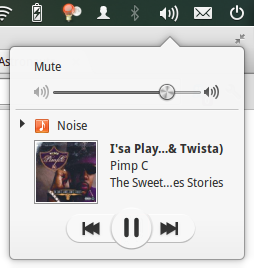 The fix for this bug makes the font size a bit smaller, according to the design spec for the sound menu. It also makes sure that labels with a width of about 25 characters are always shown in full, independent of the font size. The playback controls are centered. Play a song in Rhythmbox that has an track name (or artist or album name) that is longer than about 20 characters. Open the sound menu and see that the long label is ellpsized. If the fix to this bug is faulty, it might lead to weird menu sizes (too small or too large). The playback controls used hard-coded coordinates for drawing and hit detection. Rendering or selection bugs might occur. 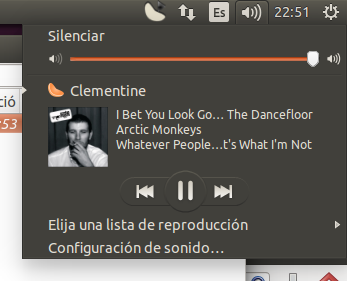 When looking at the currently running track in SoundMenu (clementine music player), the space for the title of the track and album are too small, because the album art is directly next to it. Both titles are truncated and thus almost unreadable, when longer than about 10 characters. Is it possible to put the album artwork in a different column? Or make the SoundMenu wider? 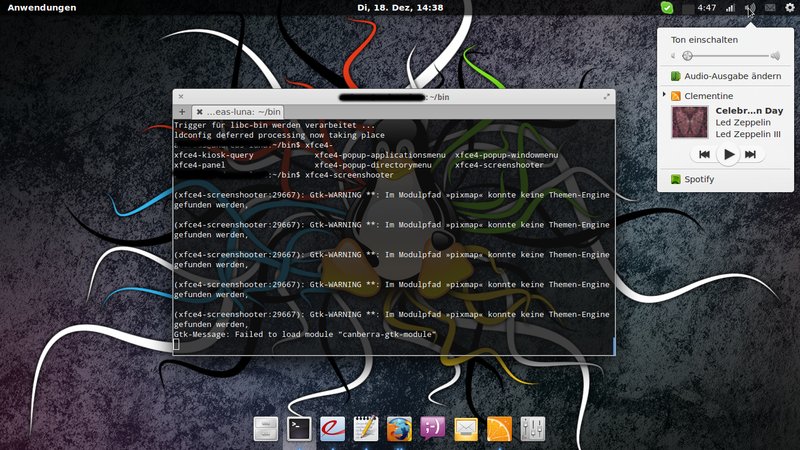 Andreas, you can use a screenshot app (like xfce4-screenshoter) to get what you are looking for. I'm not sure there's anything that can be done about this. Maybe retarget it to indicator-sound package. The menu as a whole should be a bit wider, and the track info should use the caption font size rather than the label font size. This would be a UI change, which pre-release would need a UI freeze exception. It's not a string change, which would affect translations, but I'm not sure to what extent we care about making documentation screenshots inconsistent. I'll take this up with the rest of Ubuntu SRU. @Chris: thanks for considering that SRU! Some cycles ago we had discussions about the difference between UI changes and fixes (mostly when Unity was still changing late in the cycle). That does make sense, and I lean towards acceptance. I'll wait for the rest of the SRU team to be able to express their preference, though, as this is the first time I can recall dealing with this :). I'm all for a hearty +1 on this, as long as the people testing it throw a rather varied playlist at it, with and without album art, and with varying title/artist lengths, to make sure it doesn't suffer any weird rendering regressions. Accepted ido into trusty-proposed. The package will build now and be available at http://launchpad.net/ubuntu/+source/ido/13.10.0+14.04.20140423-0ubuntu1 in a few hours, and then in the -proposed repository. The verification of the Stable Release Update for ido has completed successfully and the package has now been released to -updates. Subsequently, the Ubuntu Stable Release Updates Team is being unsubscribed and will not receive messages about this bug report. In the event that you encounter a regression using the package from -updates please report a new bug using ubuntu-bug and tag the bug report regression-update so we can easily find any regresssions.